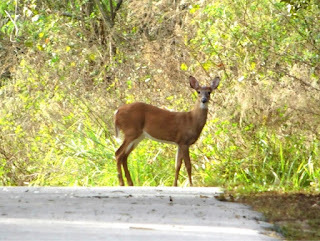 Yesterday, I took a walk along the path between Wilderness Lodge and Fort Wilderness. At one point, I came across this deer crossing about 50 yards in front of me. As I got closer, I discovered a family of about 10 deer in the woods on both sides of the path. With the natural serenity of this area, it is almost hard to imagine that the busiest theme park in the world is only about a mile from this location.